Home / Uncategorized / ABS is cordially inviting you to attend 2019 Kathina Ceremony in October on Saturday the 26th and Sunday the 27th at the ABS Temple at 423 Glide Avenue, West Sacramento. Thank you! It is an ancient tradition to hold a Kathina Ceremony by lay followers at every Theravada Temple to celebrate the end of the rainy retreat. The most significant part of the ceremony is the offering of a freshly tailored robe called Kathina Robe to the Maha Sangha by lay devotees. 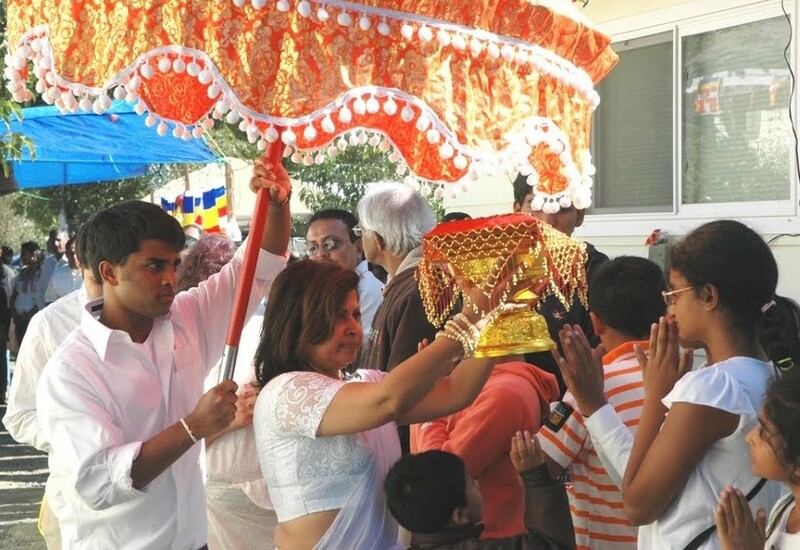 On this day, it is common for devotees to shower the Temple with large or small monetary and material gifts to sustain the temple through the year. The Buddhists especially devote this Kathina ceremony day to the practice of Dana, generosity. This is a great opportunity for you to generate merit to improve the quality of your life in this life and your future lives. By participating you improve your affinity to meet a future Buddha. Saturday evening, October 26th : The Atavisi Buddha Puja (making offering to past Twenty Eight Buddhas) is held for good health, prosperity and success of every one. If you wish to sponsor a Puja please contact the Temple as early as possible. Please be at the temple by 6:00 P.M.
Sunday, October 27th : This would be the best day to attend if you plan to participate only one day. Kathina Celebrations begin early in the morning when lay sponsors bring the materials to sew the Kathina Robe. The finished Kathina Robe is ready to offer by midday. 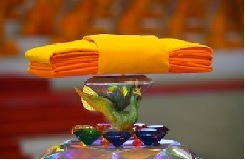 This Robe and other articles brought by lay followers will be ceremonially offered to the Sangha immediately after lunch. About twenty monks and nuns will be present. The ceremony for the general public starts at 10:30 A.M. You are encouraged to bring a dish, if you wish, to offer to the Sangha (the community of monks and nuns) and to share with other participants. The main sponsors of the Kathina Ceremony this year are Kim Hoffman, Minh Nguyen, Hanh & Bich Nguyen and Vincent Wong & family. This year we are inviting additional sponsors to join with the main sponsors to be an important part of the annual Kathina ceremony. It is regarded as a great privilege to sponsor a Kathina Ceremony and it is one of the most meritorious deeds that lay followers can perform. If you wish to sponsor Kathina in a future year, please contact the Temple to reserve your sponsorship. We warmly invite you, your family and friends to participate on both days to benefit from the activities. May the Triple Gem shower blessings upon you and your family for good health and happiness.